Ashin Pyinna Thiha is a prominent Buddhist monk and the abbot of a monastery in Kyeemyindine Township in Rangoon, which has recently become a popular venue for political events. The 47-member Maha Nayaka Sangha Council, Burma’s official state council of Buddhist monks, had previously banned him from giving Dhamma talks for one year. In September, he spoke at the Mandalay office of Aung San Suu Kyi's National League for Democracy (NLD), where he called for national unity and emancipation from fear under Burma's new nominally-democratic government. A recorded video of the event spread among the Burmese public, and apparently citing this video, the Maha Nayaka Sangha Council issued a statement saying that the abbot was “disobedient” within the monk community and was to be evicted from his monastery. The news of Ashin Pyinna Thiha's potential humiliation sent shockwaves across Rangoon and supporters have gathered at his monastery to show their concern. He still remains in his monastery and has sent a letter of apology to the council asking that it reverse its decision. Linn Thant, a reporter for The Irrawaddy, talked with Ashin Pyinna Thiha about the ongoing case and his future. Question: The Maha Nayaka Sangha Council said you are a “disobedient” monk? What does that mean to you? Answer: There is a misunderstanding here. It doesn't mean a serious breach of discipline. Being condemned as disobedient means that you are not following the teachings of senior monks of the Maha Nayaka Sangha Council. That is what their decision is about, which I think is very much reflected by the reports submitted by the lower level of the council to the senior monks about my case. Q: Have you been summoned to meet with the senior monks of the Maha Nayaka Sangha Council since the decision that you were "disobedient" was made? A: No. They can summon me at anytime, as I am not a "bad monk." They should really consider the fact that I am one of the leading monks and have devoted all my life to the propagation of Sasana (Buddhist Teachings) and the society as a whole. I have no intention of insulting the senior monks who are higher than me in terms of their age, dignity, morality, integrity and wisdom. Unless we are unified, our Sasana and our race will be in danger, that is what I am worried most about. My apology letter to the senior monks is based on my true intention of unifying all senior and junior monks. I will apologize according to our Theravada tradition and I don't want to say whether or not I am right. All I am doing is extending my apology. I love my country very much. For that, I don’t want to do anything to harm my people, my country or my Sasana. Q: When did the one-year ban from delivering Dhamma talks start? 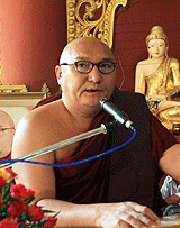 A: I have been banned from delivering Dhamma talks in Burma from Feb. 11, 2011 to Feb. 10, 2012. It was just because we hold different points of view. Being a teaching monk for thousands of young monks, when I speak my voice can be hard or tough, but I speak straight and righteously. I prefer to use a strong tone in preaching the Dhamma. I can honestly admit that I can make mistakes like others do, as people hold different points of view on certain things. But I can assure that I love my people and my Sasana more than anything else. If asked what I have done wrong, I would say "nothing." Q: Was there any particular talk that led to your ban? A: It was not any particular talk but applied to all of my talks. We may have different opinions or beliefs. I say things which I believe are righteous and I take full accountability for what I have done. Because of the ban, I haven't delivered any talks. I was invited to give admonitions, but this is not a time we should harvest disagreement among our monk community, especially with the authoritative senior monks. Our disunity won’t bring a benefit. It is the time we all monks should be unified for the sake of our country, people and Sasana. I therefore decided to apologize to the senior monks. It is because I love my country and my people. I don't think Buddha would say that when you see something wrong and/or unjust, stand by idly. Everyone has the right to point out peacefully what is not right and/or just. Pointing out something wrong and/or unjust in no way can be equated with harming someone who harms someone else. Pointing out something wrong and/or unjust doesn't not necessarily mean that you dislike a particular person either. Even if someone wants to call it harming any living creature, I think it is a good harming because it alleviates the sufferings of the helpless others, and put back the one who harms other in the first place to his/he rightful place. Then everyone will be free and equal. This is a fight between dhamma and ah-dhamma (between justice and injustice). A kingdom founded on injustice never lasts, so it is not a case of if the junta will fall - just when. Monk or even grown up man must know how to get respected from all kind of people, stayed harmless and harmonised with both sides of the world < either government or opposition>. They should know their position & live carefully in order to avoid regrettable effect to themselves by involving too much in civilian affairs. If any thing happens, they shall be blamed for themselves. There are many good monks who are doing well Dhamma as well as Public's interest. They are so smart < according to Buddha's advice> that they survive in the hands of many governments/ change in power. The most important thing is that Monk shall not hurt anyone < people that Monk like or dislike, must have a selflessness> and then achieve his intended goals. Otherwise he still need to learn to be a good Monk. I believe that If you're in the Governing Body of Monks, you'll definitely take action for those Monks who do not know their positions & purpose. Cheers! Venus wrote: " Many famous sayadaws whose preaching differ from the original Buddha's teaching are all summoned." We will clearly see what Buddha would think of today's "Buddhism". Actually, today's Buddhism should be called idol-dhism (a mixture of Buddha's teachings and idolatry. Anyway, the reasoning is simply NOT logical. Though I am ethnic Kachin and a Christian, I sense that this monk is much more honest and righteous than many other hypocrites. I think this Pone Pone is honest, sincere, straightforward, determined, courageous, responsible and empathetic monk. Feb.11, 2012 is approaching soon in one and a half month. Banning Dhamma Talk is not just him for maintaining the clean Tipitaka in Theravada. Many famous sayadaws whose preaching differ from the original Buddha's teaching are all summoned. I believe that the case of banning talk and the case of December 4 must not be the same issue. I like this monk, the way he talk and U Thu Min Ga Lar also.